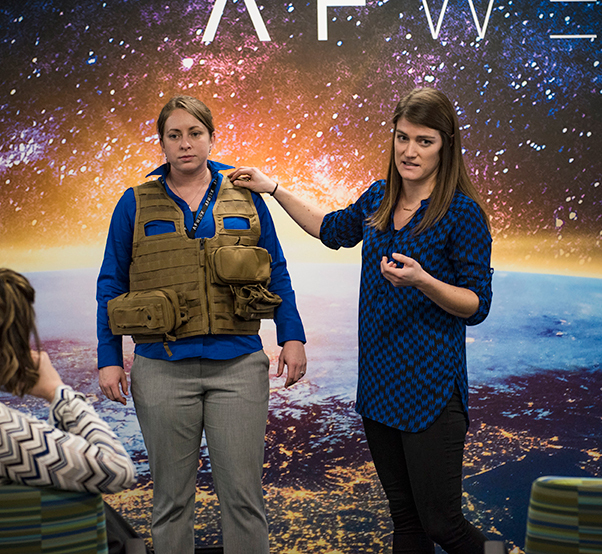 Participants of the Female Flight Equipment Workshop demonstrate the issues women face with the current survival vests at AFWERX Vegas, Las Vegas, Jan. 30, 2019. 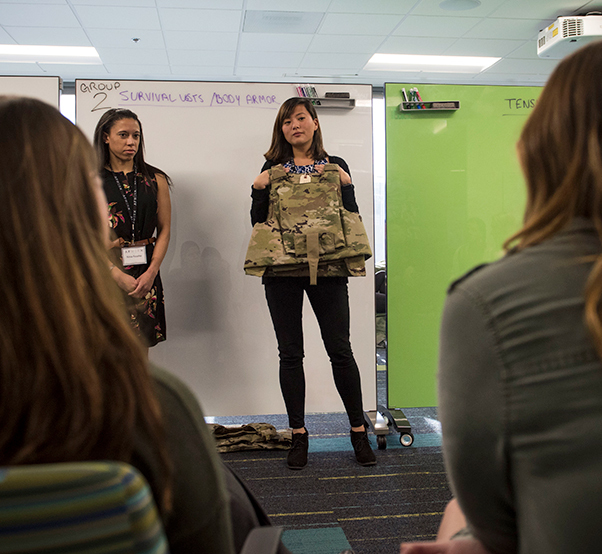 Female Airmen stationed across the globe traveled to attend the workshop to explore areas of opportunity and come up with solutions for their issues. “We have women performing in every combat mission, and we owe it to them to have gear that fits, is suited for a woman’s frame and [one] can be in for hours on end,” said Air Force Chief of Staff Gen. David Goldfein at a Defense Writers Group breakfast March 2018 in Washington, D.C. The lack of variety and representation in the current designs have caused multiple issues for women, said 14th Flying Training Wing Commander Col. Samantha Weeks, assigned to Columbus Air Force Base, Miss. “The challenges other female aviators and I face are the fit and availability of our flight equipment,” said 57th Adversary Tactics Group Executive Officer Capt. Lauren Ellis. 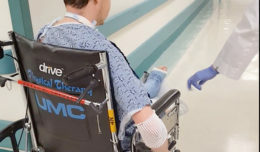 Limited sizes and accessibility often force aircrew to order the wrong size and have it extensively altered to fit properly, taking time and money away from the mission, said Ellis. 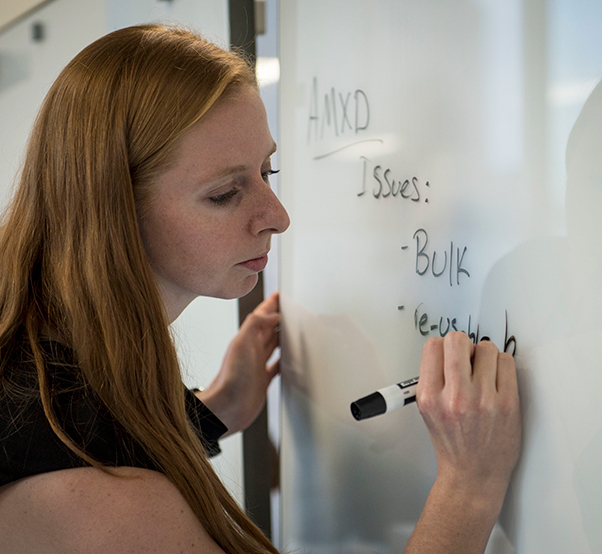 A participant of the Female Flight Equipment Workshop writes down the issues women experience with current urinary devices at AFWERX Vegas, Las Vegas, Jan. 30, 2019. Many of the uniform issues women experience involve G-suits, flight suits, urinary devices and survival vests. Even if a woman found a flight suit close to her size, the flight suit zipper is designed for men—not women. Female aircrew struggle with relieving themselves during flights because the flight suit zipper isn’t designed low enough for them to properly use their urinary devices. Along with the possibility of injury and discomfort associated with G-suits and flight suits, women struggle to get their life-saving gear to fit accordingly. The process of ejecting is so powerful, even pilots with well-fitting gear are at a serious risk of injury. It’s important for aviators to be heard and the modernization of equipment for everyone continues, said Ellis. Participants of the Female Flight Equipment Workshop review various flight suits designs at AFWERX Vegas, Las Vegas, Jan. 30, 2019. The AFWERX Vegas events established the communication needed between the consumer, designers and suppliers to reach a mutual goal of understanding and development for female flight equipment. “The purpose of the workshops is to bring together female aviators, Aircrew Flight Equipment, Human Systems Program Office personnel and subject matter experts to understand the current products, the acquisition process and the actual needs from the field,” said Weeks. 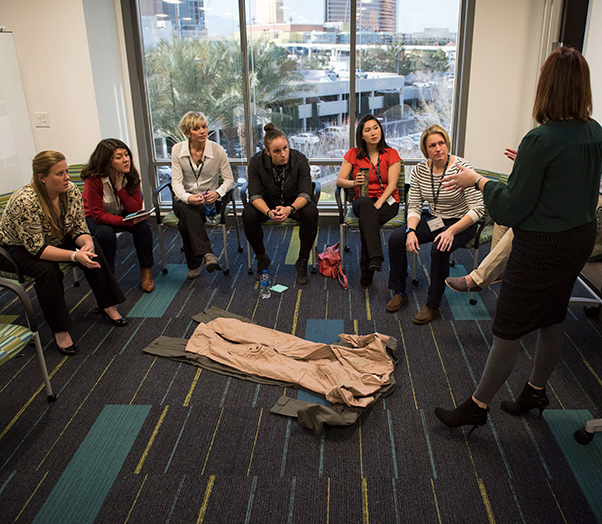 Participants of the Female Flight Equipment Workshop discuss the advantages and disadvantages of multiple piece of body armor at AFWERX Vegas, Las Vegas, Jan. 30, 2019. Throughout the workshops, aviators participated in briefings, discussions and exercises, with an opportunity to voice their concerns and opinions to the agencies involved with the design and distribution of their gear. Another major improvement for female aviators is the adoption of the Battlefield Airmen Rapid Resource Replenishment System (BARS), a centrally managed equipment facility. BARS is capable of shipping needed resources directly to female aircrew. Using this system will allow women to acquire the proper fitting equipment they need within an acceptable timeline.